The U.S dollar dominated major currencies in the previous week after experiencing a loss during the second week of the month. Join us as we look into some major fundamental and technical events that may define this weeks trend direction. This is a high impact fundamental event which is scheduled for Thursday 24 January ’19. Traders and brokers, such as BinaryCent, pay attention to the official comments that accompany the release of the official refinancing rate in the eurozone in order to decide on how it affects foreign exchange. Still, on Thursday 24th January is the press conference on the ECB monetary committee meeting. Response to questions asked during this event will pose the most risk to for the euro. Speculators, investors, and traders will be on the lookout for future changes in policy via special languages used in the meeting. Concerns over inflation support the currency, concerns over the economy lead to Euro sell-offs. It shows changes in the value of orders for durable goods (1st row) and ex transportation (2nd). It is volatile since it includes orders in the aircraft industry that are rare but costly. It is a leading indicator of production trends and investment activity. The previous result came out 0.8 in November ’18 compared to a -4.3 in October ’18. After a 15.2% increase in the price of the EURUSD from a combination of regular bullish divergence, bullish accumulation, and breakout of bearish accumulation, an opposite downward spiral was triggered by an opposite failure of hidden bullish accumulation and setting up bearish accumulation on June ’18 as it made a 7.02% price decline. The pair currently sits on bullish accumulation support at 1.2551, and trading below January price open. A future price breakdown below this support level signals an increase in sell pressure and a good entry for short selling trade. Formation of bearish signals starting from 23rd July ’18 and 24 September ’18 were countered by opposite regular bullish divergence triggered on 24 December ’18. This pattern in combination with a triggered bullish accumulation on the same date gives high prospects towards going long. However, a price close across the accumulation resistance at 1.15001 would indicate huge buying pressure on the Euro. 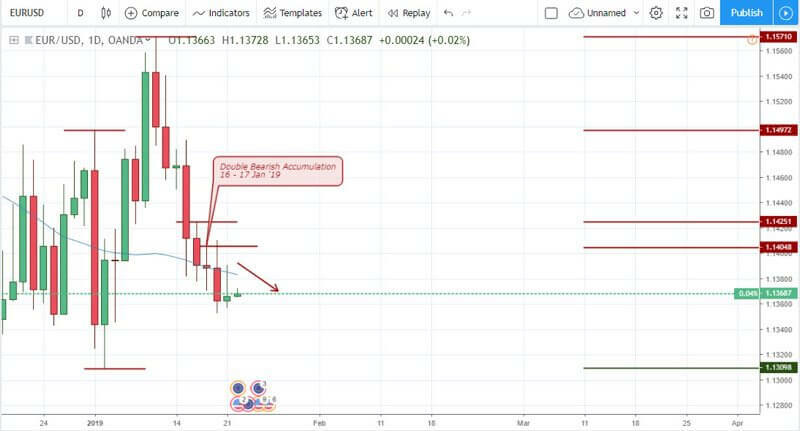 Our call to action pattern in the form of a breakdown of double bullish accumulation from the daily chart failed to an opposite breakout of the resistance level at 1.1425, resulting to a loss of 1.75% from a short entry. A signal rejection such as this implies that the weekly candles were not set for consecutive bearish closing bars. 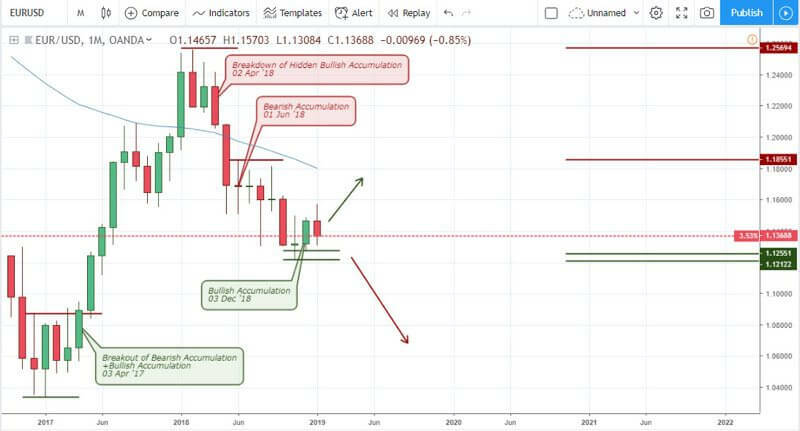 However, recent formation of double bearish accumulation between the 16th and 17th of Jan ’19, bringing the price to its current low at 1.13531. On 9th January 19 10:00, a formation of triple bullish accumulation caused the price to rise by 0.93% against a risk of 0.23%. The bullish rally was terminated by an opposite failure of bullish accumulation the next day 10 Jan ’19 06:00. This clearly highlights the consecutive bearish closing bars on the daily chart, as price plummets by 1.47% profit target compared to a 0.42% risk. A bullish regular divergence pattern is triggered on the above 4hour chart, hinting on an early exit of the bearish price drop from 10 January ’19. It’s best to stay on the sidelines at this point and wait for a bullish break either above the dark cloud cover on 21 January ’19 06:00, or the support at 1.13532. 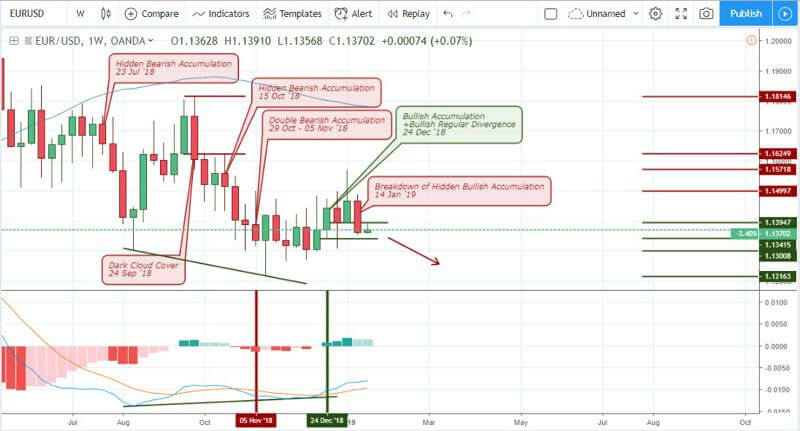 Similar to the 4hour chart, the 2hour chart as shown on most binary options USA platforms, triggered a breakdown of bullish accumulation 15 January ’19 06:00 this resulted in a 1.04% price collapse of the EURUSD foreign exchange. The EURUSD being our currency pair of interest this week is currently trapped between support and resistance triggered by both bullish and bearish accumulation patterns. As a result, a price breach of either 1.14997 or 1.13415 should give clarity towards the pairs trend direction.